For their own fancy reasons, people love drawing removal or permanent images, symbols or marks on their bodies, often known as tattoos. even some of the best artistic of tattoos have a meaning behind them. 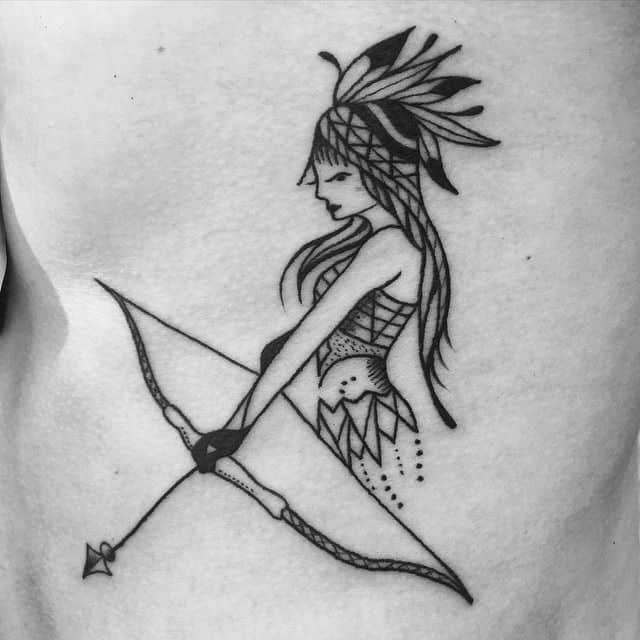 A good example is the bow and arrow tattoos, which can take many different meanings depending on the way they look, and the perspective of the bearer. The following are some examples of such tattoos along with their meanings. 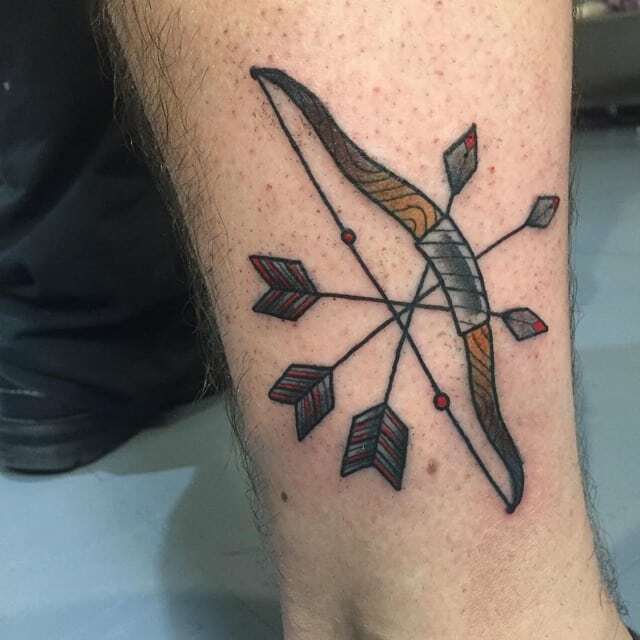 A tattoo of a single arrow can take several different dimensions of meanings. As a solitary vane, it can symbolize protection and defense or it can also be a sign of bearing, direction or movement. The image of a broken arrow can signify peace or coming into terms, while courage may be the message in the symbol of an arrow piercing the diamond. In the most common tats with two arrows, the vanes can either face away from each other or towards one another. They can also be crossed arrows. In the first case, the tat can stand for war or disagreement, while in the second case it can depict resolution and mediation. In the last case where vanes a crossed, it can be a sign of great friendship ties. 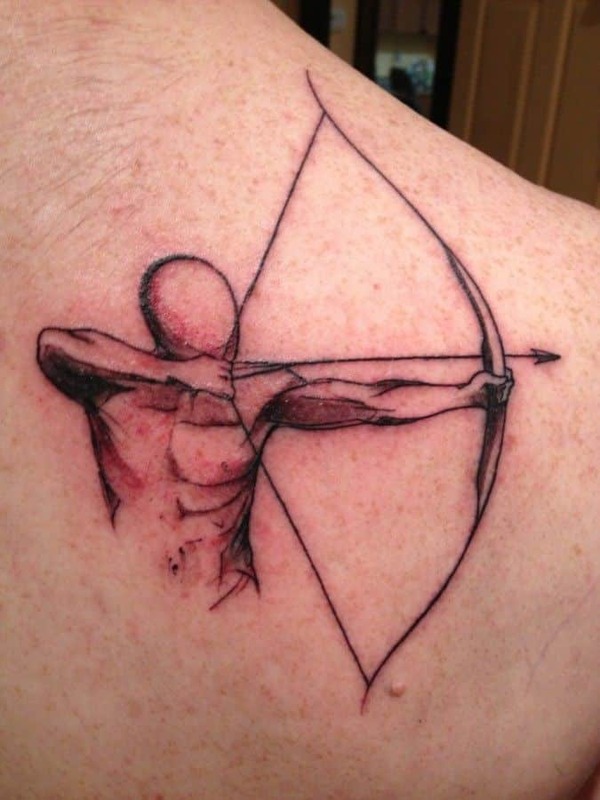 Some other tattoo drawings use a bunch or bundle of arrows to signify strength. For instance, a five arrow bunch indicates enormous toughness, oneness, or resilience. It can also mean that something or someone is tough and harder to be broken. In real life situation, one may experience something or someone that is pulling thing back or dragging them down. 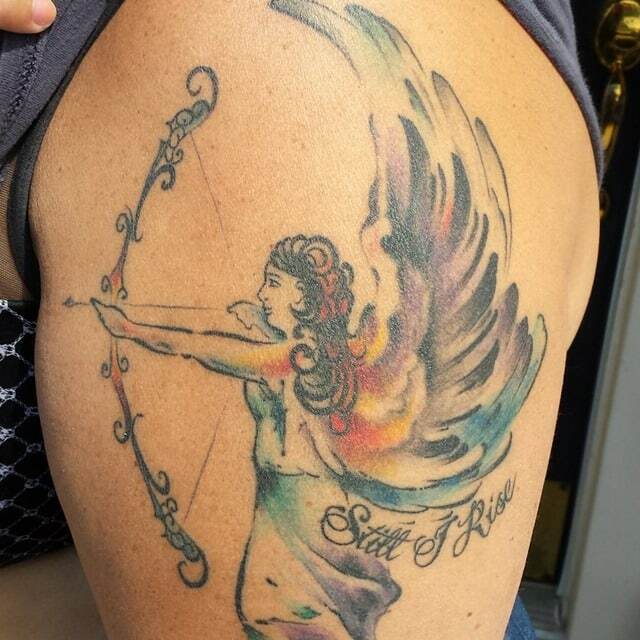 This can be represented by a tattoo of a bow with an arrow being pulled back. 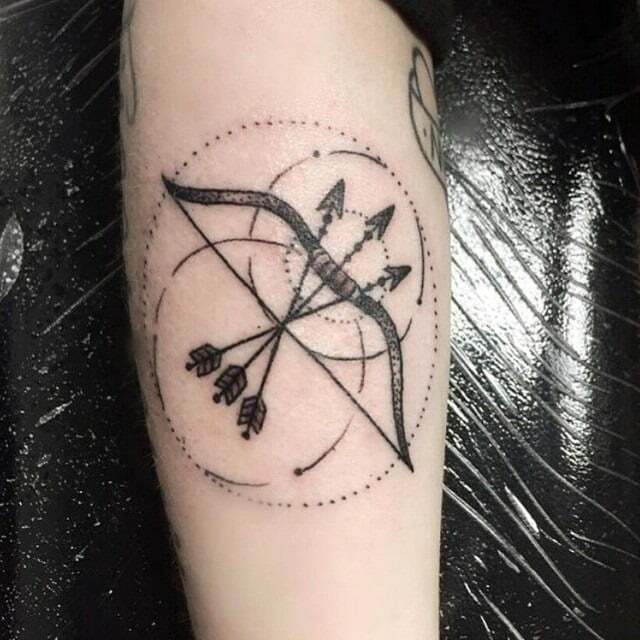 In situations where someone gets into something newer things in life or more positive achievements, or they manage to free themselves from a dragging situation, this can best be represented by a stretched arrow on a bow being released. When these two are combined in a tattoo, it means that one has to or has gone through, some challenging situations in order to get the energy to be propelled to where they are headed or where the now are. 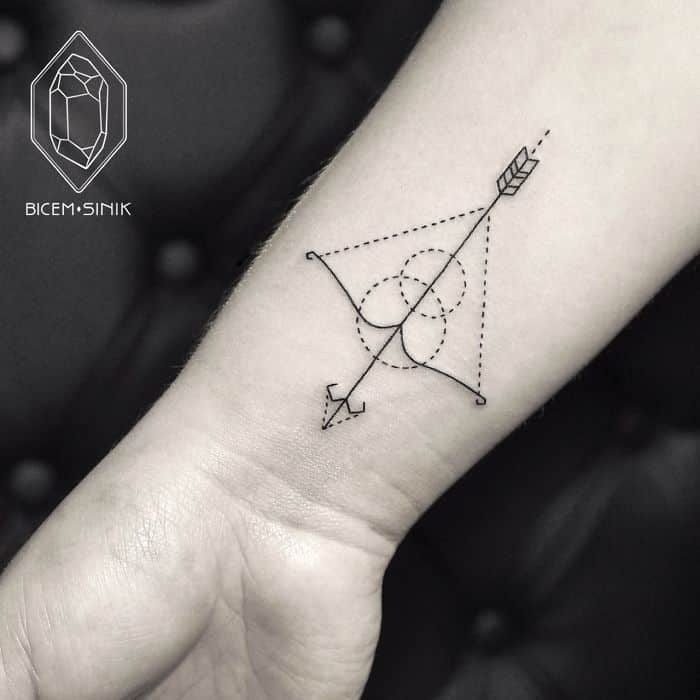 In simple terms, this kind of bow and arrow tattoos can represent getting from bad times to better situation. People have different ways of expressing or representing love; and tattoos is one of them. Apart from hearts, one of the most used drawings is the Cupid bow and arrow. This one looks like a heart that has been pieced through by an arrow, representing the cupid sting of love. It also symbolizes great directed energy towards something or someone. The Eros tattoo is another other amazing design embraced by most people in love. It basically represents the Greek god of love as small lad bearing wings, holding a bow and arrow. Sagittarius: You will in most cases see this tattoo among people born between November the 21st and December the 20th. The Sagittarius is the ninth sign in astrology or the zodiac chart. In tattoos, this one is drawn as a creature that is one part human and the other part an animal such as a horse, often the bottom part of the body from the stomach area. The upper part looks like a shirtless man bearing a bow with a stretched arrow, ready to release and appears to be aiming at something far ahead from his side. 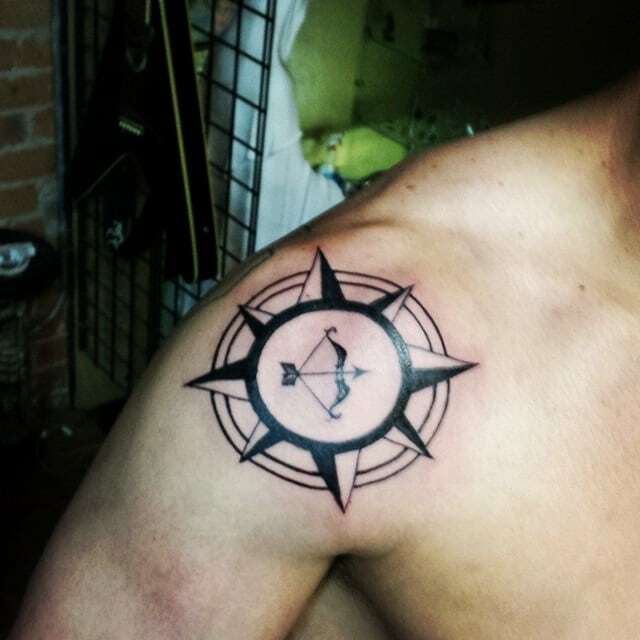 With the Sagittarius being regarded as the sign of fire in the zodiac this tattoo may symbolize great energy and charismatic nature, from the masculine perspective of it. 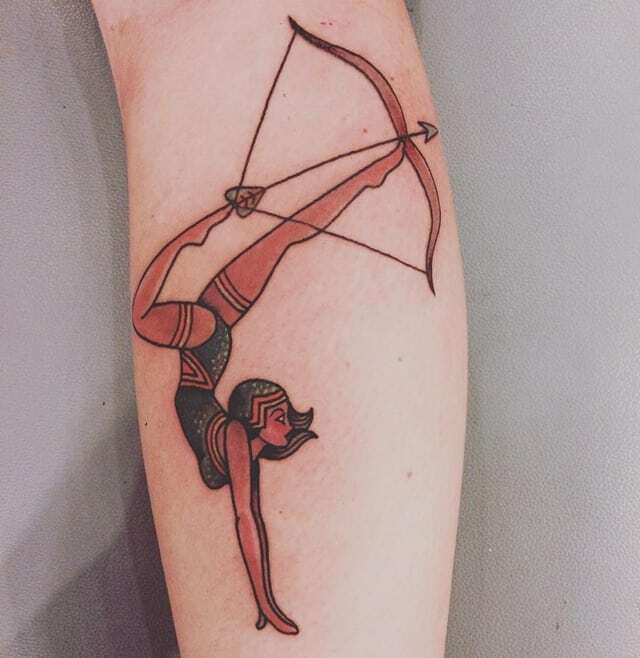 However, Sagittarius bow and arrow tattoos can also mean that the bearer has both animalistic and human personalities of character. Aiming at his target with a bow and arrow is a manly, faceless figure. He concentrates with arms raised as he draws the string with the other hand, moving towards his face without a face, ready to quickly release the arrow. 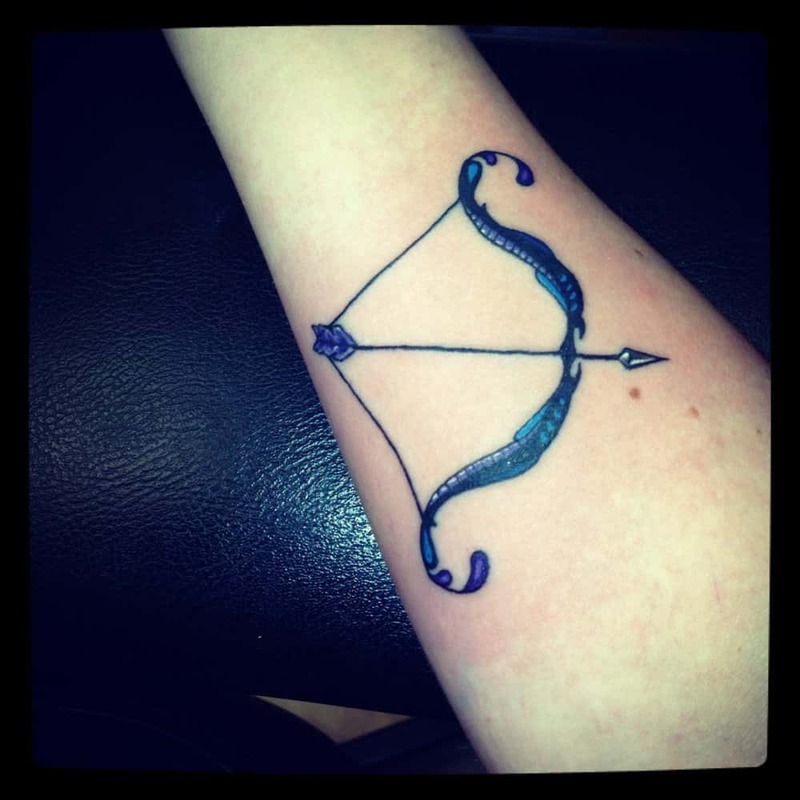 A minimalist style of bow and arrow tattoo ideas with the use of fine lines, curves, and dotted lines. The strings are pulled way back and have adapted a triangular form while big and small circles sit at the center of the bow. A petite feminine figure wearing a tiny dress and beautiful headdress over her long silken hair holds a long bow and arrow. She grips on it with gloved hands and the elegant appearance of the bow with its thin and sleek arrow matches her slender form. Stunning colors, angelic beauty, and intricate carvings create a masterpiece. A woman with wavy hair and huge feathered wings spread high and wide pulls at the strings of her ornate bow ready to shoot her thin arrow at the slightest movement of her fingers. 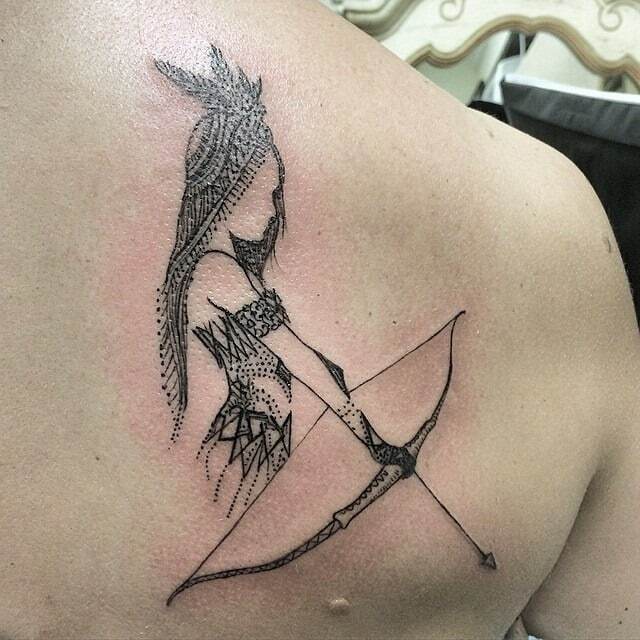 Laden gracefully on the arm near the elbow is a fascinating bow and arrow tattoo presenting a glamorous maiden aiming to shoot at her target. She tries to do so with her long legs and feet holding the archery weapon, while standing upside down on her arms. Three arrows are placed symmetrically at the center of a delicately carved bow. The arrows cross at a common point that intersects at the bowstring, while small circles fill the picture only to be enclosed with a bigger dotted circular frame. An icy cool blue bow depicts a striking vivid tattoo that stands out on the skin. The bow arrives in exquisite carvings with a slender handle and limbs that curve towards the tips, eliciting the image of the sagittarius symbol. A faceless woman with a slender body draped in a sleek dress and hair embellished with a fabulous head accessory extends her arms as she holds a long bow. The grip and limbs of the bow have thin lines of long strings. Three arrows with ornate diamond heads and finely detailed fletching rest on a bow that arrives in complex patterns. The wooden craftsmanship of the sight window and silvery sheen of the grip create a stunning emblem of arrow and bow tattoos. A circular backdrop has double black outlines, wherein another circular form is found within radiating pointed rays throughout its circumference. Right at the center of the solid inner circle of the compass is a small but highly detailed elegant bow and arrow.